Top row: 2 out of 3 kids love their new shoes! Okay, 1 out of 3 really loves them, 1 tolerates them, and 1 pranced around like a sillyhead and silently pleaded with her dog eyes for Mama to take them off as we all laughed at her. Third row: Did you know even fairies get sad sometimes? Mostly when their cousin and mama won’t let them play the “I’m a Goofy Goober” SpongeBob song for the 89th consecutive time; these are my new Belle slippers, and yes, I’ve noticed they look sad but I LOVE THEM! ; Remember how I said layering is key with the tutu? Here, it’s under my heart hoodie dress, over my star tights, under my signature coat. The accessories include my crazy lady hat and Mama’s sarcastic favorite book, “On Beyond the Zebra!”. It’s like 200 pages and according to Mama, it doesn’t make any sense. It’s awesome. 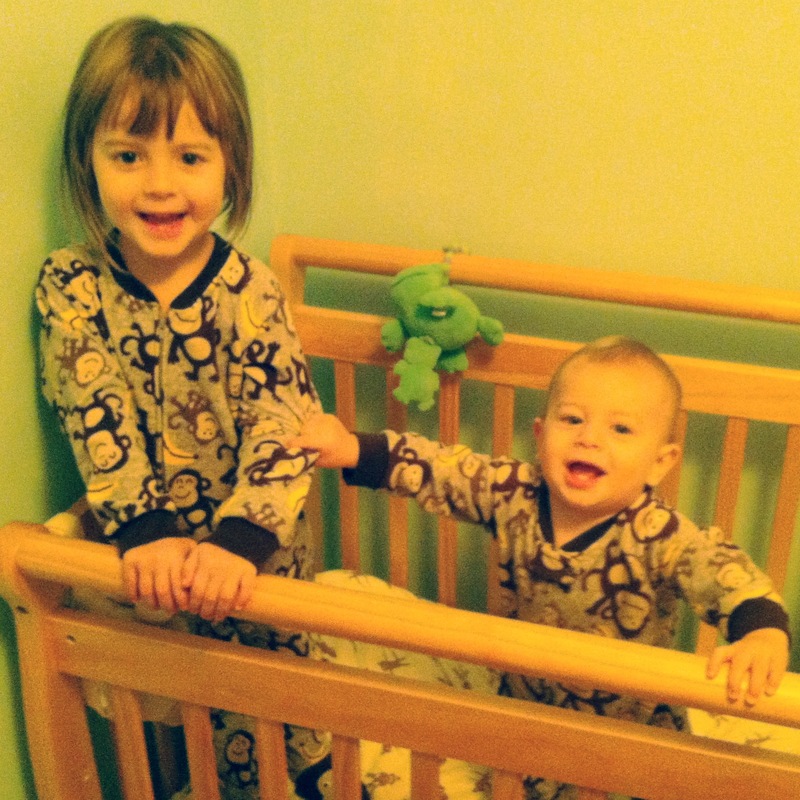 We’re thankful for our matching monkey jammies, even though years from now, this will embarrass us horribly. 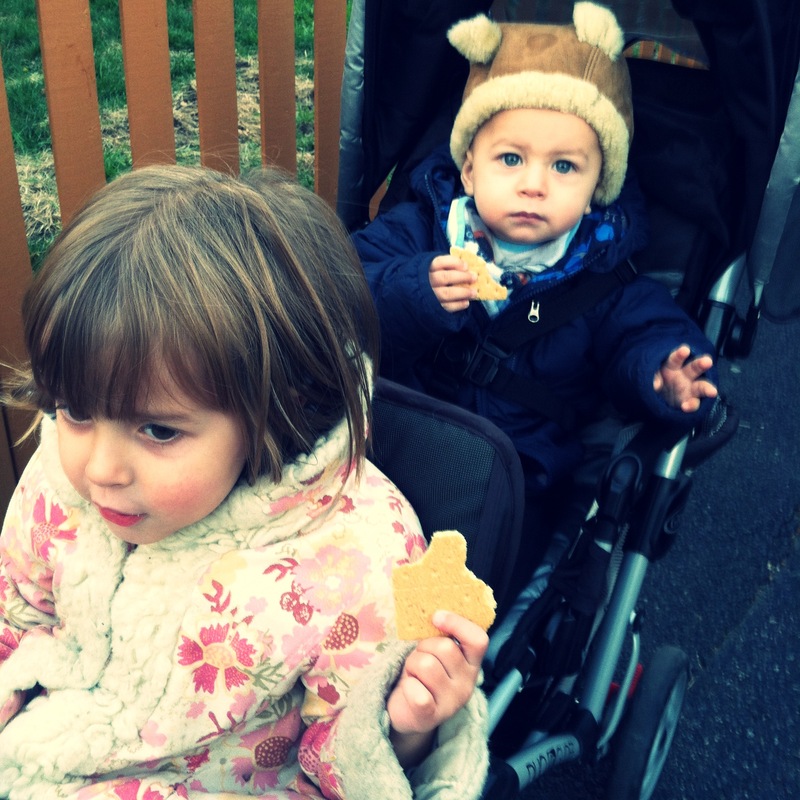 We’re thankful for our double stroller, even if Mama complains THE WHOLE TIME SHE PUSHES IT. Also, graham crackers. • Crazy Bugs Mac & Cheese: I eat this about 2-3 times a week for dinner. The other nights, I eat chicken nuggets, pizza, a hummus sandwich, or my salty tears because I don’t like any other foods. • My lip stuffs: I have three, a regular Chapstick, and two (collector’s item) Hilary Duff ones. I put them on every morning with Mama in the car. She says, “only on your lips!” but I like to put it on in between my lips and my nose and on my chin too. • My mix CD’s: we have the flower CD and the one called CD Compact Disc. I know which song is which number on each CD and boss Mama and Dada around accordingly. It’s not rude if you say “please” afterwards. Usually, we just listen to #6 on the flower CD (“Is this the real life?”) over and over again until Mama says it’s time to take a break which is code for no more “Is this the real life?”. • My book collection: I love reading. I especially love reading Dora and the Mermaid Kingdom, What Do You Want To Be, Dora?, and I Love My Papi (by Dora). I also like the Princess book I have where you have to find things on every page, like the one where you have to find all the accessories that the other princesses at Prince Charming’s Ball have lost. Find this princess’ earring! And this princess’ purse! It’s great. I don’t know why Mama makes the crying/soul dying sound every time I ask her to read it to me.